The wrestling regular season is coming to a close right before our eyes, and the team is doing its best to gain momentum as it heads into the postseason. Coming into last weekend, the wrestlers all knew perfectly well that the quad meet on “Senior Day” would be the best chance to impress and to improve their individual rankings. 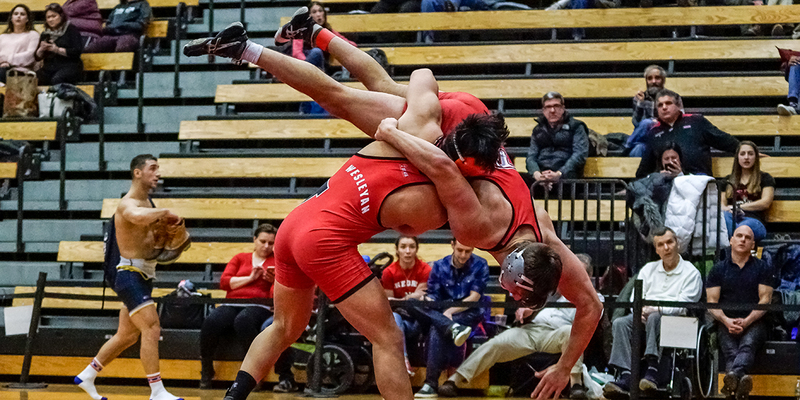 After going 2-1 in the last three dual meets, Wesleyan managed to remain undefeated on the day by beating American International College (47-6), The College at Brockport (27-11) and Norwich University (43-9) in three landslide victories. Prior to the matches, the Cardinals honored their six seniors: Carter Armendarez, Isaiah Bellamy, Devon Carrillo, Ed Pierce, Dominic Pirraglia, and Matt Winchester for the success they’ve had on and off the mat and for all of their contributions to the program. Featuring a strong senior class, the Wesleyan squad has benefited from its past experiences and the strong leadership of its departing members. A brief recap of their seasonal highlights must start with two of the four captains: Carrillo and Bellamy. Each of the two was only defeated twice this season while picking up nearly 30 victories and registering 20 and 19 pins, respectively. Captains Armendarez and Pirraglia have records that are less jaw-dropping but are impressive nonetheless. They have gone 26-8 and 18-8, respectively. Finally, the other two seniors delivered the most exciting games of the season: Pierce’s pinfall win against Isaac Collier from Case Western Reserve at the RIT Invitational and Winchester’s 50:0 victory over Donald Yancy from Bridgewater State at the NEWA Open. Such acknowledgment, however, does not downplay the contributions of other team members, as wrestling requires a well-balanced roster to secure the most team points. It is worth mentioning that juniors James Matias and Zack Murillo both emerged as the team’s most consistent and reliable players for their impressive records (18-8 and 18-7), and first-years Simon Chee, Andrew Hennessy, and Harrison Karp have all played significant roles throughout the season. Perhaps motivated by the spirits of the day, the Wesleyan wrestlers seemed to be more energetic and confident than ever for the audience. Without facing much resistant, they started the day with a comfortable victory over AIC as they registered five wins by forfeit and two wins by technical fall. Still, Chee and Carrillo did add some excitement to the uneventful match by showing remarkable dominance at 184 and 197, respectively, much to the delight of the home fans. In their second game against No. 16 Brockport, the Cardinals finally faced the challenges they were seeking. Although the scoreboard may imply another effortless victory, the process was far from simple as the wrestlers gave out their best in picking up decisions. This was also reflected in the nail-biting battle at 197, where the No. 6 ranked Carrillo was defeated by Triston Engle, the No. 7 ranked wrestler in DIII. In addition, the two pins in the game went to Pirraglia and Bellamy, who seized their chances in their only appearances of the day. Rather than feeling self-satisfied after a 2-0 start to their day, the Dirty Birds kept their heads down and continued to impress as they entered the last game. Once again, the Cardinals proved that the Cadets of Norwich are among their favorite opponents. As Amir Daouk ’20, Murillo, Matias, Armendarez, and Pierce brought five straight victories for Wesleyan with pins and major decision wins, the Cardinals finished things off quickly as the score mounted to 25-0 at half-time. After Carrillo registered another pin just 13 seconds into the match, the resilient wrestler finally broke his personal best once again and allowed the final score to arrive at 43-9. With the three-game sweep on Sunday, Wesleyan now improves their season record to 12-7, and is down to the last tournament of the season before entering the championships. They will be back on the mat this Sunday, Feb. 18 at the NEWA Futures Tournament hosted by Roger Williams University.